Don't be mistaken, this Chile Jam, is not meant to be spread over your bread or toast for breakfast like the regular jam! But then if you would like to do that, no one would stop you! I did try actually, haha! It is quite nice, considering that this is not spicy at all. According to Nigella, this Chile Jam is usually eaten with cold meats or a cheese plate. An equal proportion of Red Chile and Red Bell Pepper is used for a mild spiciness. For a spicier kick, Hot Red Chile may be increased, and use less of the Red Bell Pepper. I used equal amount of both, I would love to have a spicier taste, but then, I have kids in the house, and too spicy is a no-no! Half a cup of chopped Red Chiles, about 4 large. I only made half the recipe from the original recipe below. Since I do not own a food processor, I chopped the chiles instead. Half a cup of chopped Red Bell Pepper, about 1 medium. Apple cider vinegar, sugar and powdered pectin are boiled until sugar and pectin dissolves. Chopped chiles are then added in, leave to boil for about 15 minutes. Leave to cool slightly, about 40 minutes until the chiles are suspended in the jelly. Ladle into the sterilized jars. The vibrant red colour of the Chile Jam. I could not get a nice shot of the jars without any reflections on the jars. I tried putting them on the counter, near the window, in various places, in the end, I gave up. That is, until much later at night, when I wanted to store the jar in the refrigerator, my goodness, it looks so lovely in the refrigerator, no reflections at all! Hahaha! Imagine that, the best shot is taken from my refrigerator! The vibrant red, beautiful Chile Jam! There are lots of way to use this Chile Jam, as a marinade, as a sauce dip, etc... I'm really looking forward to use this soon. I have been eyeing this recipe ever since I saw it from my sister's Nigella Christmas cookbook more than a year ago! Now I have a copy of this book, got it real cheap at a recent sale. Don't you just love sales, especially when there's cheap and beautiful cookbooks around? Hehehe! I'm submitting this to the Christmas Giveaway in The Sweet Spot, any dish or bake, sweet or savory, with green and/or red in it. Please hop over to The Sweet Spot for more details. Sterilize your jars and leave to cool. Put the cut-up chiles into a food processor and pulse until they are finely chopped. Add the chunks of bell pepper and pulse again until you have a vibrantly red-flecked processor bowl. Dissolve the sugar and pectin in the vinegar in a wide, medium-sized pan over a low heat without stirring. Scrape the chile pepper mixture out of the bowl and add to the pan. Bring the pan to the boil, then leave it at a rollicking boil for 15 minutes. Take the pan off the heat and allow it to cool. The liquid will become more syrupy, then from syrup to viscous and from viscous to jelly-like as it cools. After about 40 minutes, or once the red flecks are more or less evenly dispersed in the jelly (as the liquid firms up, the bits of chile and pepper start being suspended in it rather than floating on it), ladle into your jars. If you want to stir gently at this stage, it will do no harm. Then seal tightly. Make the jam up to 1 month before using or giving. Store in a cool, dark place for up to 1 year. Once opened, store in the refrigerator and use within 1 month. * For a slightly softer set, use less 1 tablespoon of the pectin. I guess the quality of the pectin varies. The one I used has no brand, other than the indication that it is from France. But it does not effect the taste of the Jam, really good. * For half the recipe, I only got about 2-1/4 jars of 250ml-sized jars. 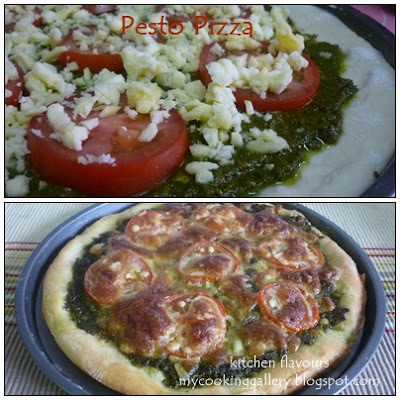 This Pesto Pizza is now my favourite pizza! Really! "Such a simple pizza, yet totally divine" as described by Rebecca Baugniet from the book "500 Pizzas and Flatbreads". And it is exactly that! I use my Homemade Basil Pesto from my previous post, told you that I'm making something delicious! And could have knock myself for not trying this out sooner as making Pesto has been on my list for months! The taste is unbelievably delicious! So simple, yet so full and packed with flavour! This is a thin pizza crust and it is so, so, crispy and tasty. The recipe states that the dough is to be divided into three, to make three 12-inch round pizzas. But my skill at rolling the dough to 1/2" pieces badly needs more practice (more pizza to eat! hahaha!). So I only made two pizzas which are meant for three! I thought that it would be like the regular crust, but am surprised that it actually turns out quite thin and oh, so crispy! I actually made this same crust for a sweet pizza in one of my older post, Strawberry Streusel Pizza. Simple and easy, with only three ingredients for the topping. Pesto, tomatoes and cheese! I have already used up more than half jar of my Homemade Basil Pesto. Eagerly waiting for my basil plant to grow, for my next jar! Perfect crust! Delicious topping! Definitely my favourite pizza, at the moment! Preheat the oven to the maximum setting, usually 240C (475F/Gas Mark 9). Place pizza stone or unglazed clay tiles on bottom of gas oven or lowest rack of electric oven. Make three 30-cm (12-in) discs of pizza dough. Lightly dust pizza peel with flour or cornmeal. Place one 30-cm (12-in) disc of pizza dough on peel and spread 60ml (4 tbsp) cup pesto over the dough, leaving a 1cm (1/2 in) border around the edge. Arrange 6 to 8 slices of tomato and sprinkle 1/3 of the grated mozarella on top. Gently shake pizza from the peel to the stone or tiles. Bake for 4 to 6 minutes, until cheese is melting and base is puffy around the edges and crisp on the bottom. Slide the peel back under the pizza to remove from oven. Repeat with remaining 2 pizzas. This base rises only once and bakes in minutes, making it the quickiest base to make. It can be made into three 30-cm (12-in) pizzas, as desribed below, or divided into six individual 15-cm (6-in) pizzas. Baking time remains consistent. To prepare the pizza dough, combine flours. Mix 225gm (8oz) flour with the sugar, yeast, and salt in bowl of standing mixer. Set aside. Combine olive oil and warm water. With paddle attachment, slowly stir in the water and oil into the flour mixture until well combined. Mix in the remaining flour. Change to dough hook attachment and knead on low for 4 to 5 minutes, until dough comes together as a ball and is smooth and elastic. If not using a standing mixer, turn dough onto a lightly floured surface and knead by hand for about 10 minutes. Place dough in lightly oiled bowl and cover with clean paper towel. Set aside in a warm spot for 1-1/2 to 3 hours, until dough has almost doubled in volume. Once dough has risen, use a sharp knife to divide the ball into 3 equal pieces. Shape each into a ball, and flatten to form a disc. Using fingers or rolling pin, stretch out each dist co 30-cm (12-in) rounds, which is very thin - about 2mm (1/12 in). I have never tasted Pesto before this! Reason is Pesto is not exactly an Asian sauce. Ever since I started to blog, I have been seeing lots of Pesto recipes and in cookbooks too! Well, I was curious! It does sound delicious, as I love basil! There are ready-made Pesto sold in jars in certain supermarkets, but the thought of making my own has been on my mind for several months now. Basil leaves from my garden, smells wonderful! I did a search for Basil Pesto recipe and came to the conclusion that there is no fixed measurement when it comes to making Pesto. It all depends on individual taste. And I do not have a food processor, (it has been on my wishlist for quite a while! ), so I use the blender. Though the traditional way of making Pesto is by using the mortar and pestle, which would give a tastier result as the basil and the rest of the ingredients are pounded together, thus giving a maximum flavour. Some recipes I've read, calls for the ingredients to be chopped, that's a lot of chopping to do! But for convenience and a quick time saving effort, the food processor is used by most people. Pine nuts are extremely tasty! And expensive! May use walnuts instead. My homemade Basil Pesto, organic Basil leaves from my own garden. The satisfaction of seeing home-grown herbs in a delicious paste. This sauce is delicious, now I know what the fuss is all about when it comes to Basil Pesto! (wink!). I have almost finished this jar of pesto! Made something delicious with this pesto, coming up in next post. I'm already planning on making the next jar, with a mixture of fresh parsley! Put all ingredients except salt and pepper into a food processor or blender. Blend to a paste, slowly pour in the olive oil as you blend. More olive oil can be added for a thinner Pesto. Season with salt and pepper. Store in glass jar and keep in the refrigerator for up to 2 weeks. Pesto may be stored in freezer for up to 3 to 4 months. Simply freeze them in ice cube trays, once frozen, remove and store in a container, in the freezer. For our Bake-Along #13, Lena from Frozen Wings, Zoe from Bake For Happy Kids and myself, we baked Key Lime Cupcake, recipe taken from Bon Appetit Dessert Cookbook. This is a really nice cupcake, perfect with the cream cheese frosting. I did add on a little of the green food colour to make it a lovely green. The cream cheese frosting is "melting" real fast, due to the extremely hot weather here, it's blazing hot, 95 degrees F, the sun is glaring and I can feel the heat on my skin at 4.00pm! The cream cheese is getting very soft, I've got to put away the cupcakes in the fridge for the cream cheese to firm up again! Overall this is a nice cupcake, the texture is soft and moist, we really enjoyed it. And check out our lovely badge, designed by Zoe. Thank you, Zoe! You many copy the image if you like and paste it over at your post for each Bake Along that you join in! To view this cupcake baked by other bakers, click on the linky below. Please feel free to join in. For our next Bake-Along, we will be baking based on a theme, which is "Pancakes and Crepes". Whip out your best pancakes or crepes, treat your family and friends with some delicious homemade pancakes or crepes and share that with us on 08/12. See you! Cupcakes : Preheat oven to 350F. Line 12 standard (1/3 cup) muffin cups with paper liners. Whisk both flours in medium bowl to blend. Using electric mixer, beat butter in large bowl until smooth. Add sugar, beat to blend. Beat in eggs 1 at a time, then lime juice, lime peel, and food colouring, if using. (Batter may look curdled). Beat in flour mixture in 3 additions alternately with buttermilk in 2 additions. Spoon scant 1/3 cup batter into each liner. Bake cupcakes until tester inserted into center comes out clean, 20 to 25 minutes. Cool 10 minutes in pan. Remove cupcakes from pan; cool completely. Frosting : Using electric mixer, beat all ingredients in medium bowl until smooth. Spread over cupcakes. This is my first posting with The Cake Slice bakers and I am pretty excited! We are currently baking from The Cake Book by Tish Boyle, and it so happens to be my favourite baking book at the moment! And I was thrilled when this recipe was chosen for this month's bake. The moment I browsed the book, this recipe was bookmarked, along with a few others! But without the convenience of buying canned pumpkin puree off the rack, I would have to make the puree myself. Canned pumpkin puree is not easily available here, but fresh pumpkins are. The thought of making my own puree actually keeps me from trying out this cake sooner. We have pumpkins whole year round, so making our own puree is not a problem, that is if you can spare some time and effort. So now, I do not have any excuse not to go ahead and make the puree and start baking this cake! The bottom crust is really nice. I could not find any pecans, so I just used ground hazelnut instead, which I happen to have exactly 33gm, the amount needed for! Co-incidence, maybe it was meant for this cake after all! It turned out really well, I really like the crust, with bits of crystallized ginger, also I do not have a food processor,I just used a pastry binder to mix everything into coarse crumbs, then I briefly knead by hand and need to add in about 3 tablespoons of flour as it was really, really sticky. It works out fine after that. The cheese filling is really good. I use 1/2 teaspoon of ground cinnamon instead of 1 teaspoon, as I want just a light fragrance of the spice. The sweetness is just right, it is not overly sweet and the texture is fabulous. I made the pumpkin seeds a couple of days earlier and got to stop myself from munching them all up! Overall, this is one delicious Pumpkin Cheesecake. Tish Boyle did it again! This recipe is another wonderful keeper! Please visit The Cake Slice Bakers to see this delicious cheesecake from the other members. Position a rack in the center of the oven and preheat the oven to 350F. Lightly grease the bottom and sides of a 9x3-inch springform pan. Cut an 18-inch square of heavy-duty aluminium foil and wrap the foil around the outside of the pan. Place the flour, sugar, salt, pecan, and ginger in the bowl of a food processor and process until the pecans are finely ground. Add the butter and process until the mixture forms coarse crumbs. Add the water and process until the dough starts to come together. Press the dough into an even layer over the bottom of the prepared pan. Bake the crust for 25 to 30 minutes, until it is just beginning to brown. Place the pan on a wire rack and cook completely. Reduce the oven temperature to 325F. In a medium bowl, whisk together the pumpkin puree, heavy cream, vanilla extract, cinnamon, ginger, nutmeg and salt. Set aside. In the bowl of an electric mixer, using the paddle attachment, beat the cream cheese at medium-low speed until creamy, about 2 minutes, scraping down the sides of the bowl as necessary. Gradually add the sugars and beat until blended. Add the pumpkin mixture and mix until blended. Add the cornstarch and mix just until combined. Add the eggs one at a time, mixing well after each addition and scraping down the sides of the bowl as necessary. Remove the cake pan from the water bath, place the pan on a wire rack, and carefully loosen the foil. Immediately run the tip of a paring knife around the sides of the pan, to prevent the top from cracking. Let the cake cool completely. Refrigerate the cheesecake for at least 4 hours before serving. Position a rack in the center of the oven and preheat the oven to 325F. Lightly grease a baking sheet. Place the pumpkin seeds in a small bowl. In another small bowl, whisk the egg white just until frothy. Add just enough of the egg white to the pumpkin seeds to coat them. Add the salt, sugar and cinnamon, and toss well to coat the seeds. Spread the seeds in a single layer on the prepared baking sheet. Bake, tossing them occasionally with a metal spatula, for 15 to 20 minutes, until they begin to dry and colour. Place the pan on a wire rack and cook completely. With your fingers, separate any clumps of seeds. (The seeds can be stored in an airtight container for up to a week). To serve, remove the side of the pan and slice the cake with a thin-bladed sharp knife, wiping the knife clean between each cut. Garnish each slice with a dollop of whipped cream and a sprinkling of sugared pumpkin seeds. Store in the refrigerator, loosely covered, for up to 5 days. In the chilled bowl of an electric mixer, using the whisk attachment, whip the cream at high speed just until it begins to thicken. Add the sugar and vanilla and beat until soft peaks form. Use immediately, or cover and refrigerate. (Store in the refrigerator, covered, for up to 2 hours). For this week, I Heart Cooking Club, which is currently cooking from Tessa Kiros's recipes, theme is "Orange Skies". So, naturally I search for recipes with oranges as the ingredient. I did not want to bake any cakes or desserts, but wanted something savory instead. While looking for recipes with oranges, I came across this Carrot Salad which sounds interesting with cardamon, ginger and lemon as the ingredients. And decided to give this a try instead. I have never tried carrots as the main ingredient in a salad before. It has always been ''one of the ingredients", along with other veggies. The recipe calls for the carrots to be processed in a blender but not too fine as to keep some texture, but I grated the carrots instead, as I prefer to have more texture in my salad. This is a pretty simple and quick salad to put together. According to Tessa Kiros, this recipe is a friend of her mother's, who picked up this recipe in India. And this salad works well with spicy food. Overall review : I like it. The sweetness of the carrots blends well with the spiciness of the cardamom, ginger and pepper, the tinge sourness of the lemon and the freshness from the mint leaves. Though I did not have this with any spicy food, yes, I think that it will complement well indeed with spicy meat dishes. I have some leftover which I kept in the fridge, and it tastes even better the next day! To view other delightful yummies based on the theme "Orange Skies" hop over to I Heart Cooking Club. Put the carrots in a blender and pulse into small pieces (not too fine as you need to keep some texture). Transfer to a bowl, add the onion, and mix together well. To make the dressing, whisk together the lemon juice, oil, salt, sugar, white pepper, ginger and cardamom. Add to the carrots and onion, toss well, and then chill for a few hours. Toss in a few mint leaves before serving. This is another lovely recipe from the book "Cake Simple". Chocolate and Mint, they are certainly meant for each other! I love bundt cakes, as they are simple and elegant, and since I do not like overly sweet desserts, I seldom iced or glaze my cakes, and mostly bundt cakes do not need any "dressing" to make them taste good! 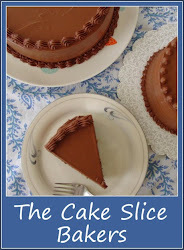 Well... sometimes there is an exception, like this cake, tastes extra delicious with the ganache! My daughter has been asking for mint chocolate cake a number of times. So I made this, and it is really, really good! The cake is moist, soft with lovely texture, the mint and the chocolate all comes together in each spoonful. I made the ganache, using some mint leaves from my garden. Though, I think that if you do not have any mint leaves, you can just omit them out, since the cake itself is full of the mint flavour, you would not miss out on the mint! As you can see from the first picture above, I did not pour all the ganache on the cake, reserving it for individual serving instead! And as usual, I reduced the sugar for the cake! This is a cake to bake for chocolate and mint lovers! If you are not, then you will be after having this! Preheat the oven to 350F (180C/Gas 4). Brush the inside of a 10-cup (2.4L) Bundt pan thoroughly with the melted butter and dust it lightly with cocoa powder. (Use a pastry brush to help distribute the cocoa powder and tap out any excess). Put the chopped chocolate in a small heatproof bowl and pour the boiling water over it. Whisk until the chocolate is thoroughly melted and the mixture is uniform. Let cool to room temperature. Whisk the granulated sugar, brown sugar, flour, cocoa powder, baking soda, baking powder, and salt in a large bowl until thoroughly combined. In the bowl of a stand mixer fitted with a whisk attachment, mix the buttermilk, eggs, vanilla, peppermint extract, vegetable oil, and melted chocolate mixture on low speed until thoroughly combined. With the mixer still on low, gradually add the dry ingredients to the wet ingredients, mixing until all the dry ingredients have been incorporated. Increase the speed to medium-low, and mix for another 3 minutes. Pour the batter into the prepared pan, smooth the top, and bake for about 45 minutes, until a cake tester inserted in the center comes out clean. Let the cake cool in the pan on a wire rack for 15 minutes, then invert the cake onto the rack and let it cool completely. Spread the cooled cake with the ganache and garnish with fresh mint leaves. The cake will keep in an airtight container at room temperature for up to 3 days. Put the chopped chocolate in a small heatproof bowl. In a small nonreactive saucepan over very low heat, combine the cream with the mint leaves and heat for about 10 minutes. Do not let the cream boil. Strain the hot cream over the chocolate and let stand for about 3 minutes, until the chocolate has melted. Add the fleur de sel and whisk until the mixture is smooth uniform. The ganache will keep in an airtight container in the refrigerator for up to 1 week. Bring to room temperature before using. A friend gave me some mangoes last week, harvested from her tree (how nice to have a mango tree!) and now that the mangoes are ripe, time to enjoy them sweet and juicy, and reserved some for this delicious cupcake! This cupcake has already been on my list to bake ever since two weeks ago, perfect timing too, for me to submit to Aspiring Bakers' theme for November, Enjoy Cupcakes! But instead of 12 cupcakes as stated in the book, I only got 9, and I use the regular sized-muffin pan as indicated. Review for this cupcake : It is soft, moist and tender, the mangoes are soft and delicious, and perfect with the flaky chewy coconuts. I like to use sweetened coconut flakes over the dry dessicated coconut as the coconut flakes are much coarser in texture and moist, it gives a lovely chewy coconut taste in each bite. There is no vanilla extract in the recipe, but the lime zest and juice takes care of that really well. The next time I would add about 1/4 cup more chopped mangoes. And the sweetness is just right! Really good. And I like cupcakes like this, good on its own, without the need for any frosting or icing. Oops, sorry for this poor photo! I made the cupcakes at night and this photo was taken at 10.00pm, did not check the photos after that! Gave some cupcakes to my neighbour, and we finished the rest, one each! No more cupcakes to "model" for me! LOL! But it is really moist and delicious, will definitely bake this again. Preheat the oven to 325F (170C/Gas 3). Line a standard 12-cup muffin tin with paper liners. Combine the flour, shredded coconut, baking powder, and salt in a small bowl. Beat the butter, sugar, and lime zest in a medium bowl with an electric mixer on medium-high speed until pale and creamy. Add the eggs one at a time, beating until just blended after each addition. With mixer on low speed, add the mixed dry ingredients, alternating with the coconut milk and lime juice. Stir the mango in by hand. Spoon the batter into the prepared cups, filling each one three-quarters full. Bake for 25-30 minutes, until golden brown and firm to the touch. Transfer the muffin tin to a wire rack. Let cool completely before removing the cupcakes. Top each one with mango slices and coconut flakes. We had a lovely lunch a couple of days ago. Made a simple Sauteed Potatoes with Egg and a simple, flavourful Cherry Tomato Pasta. I Heart Cooking Club is currently cooking with Tessa Kiros's recipes. I have not heard of Tessa Kiros before this. No idea who she is! Well, now I do! A simple and delicious lunch. Potatoes are boiled and pan-fried till brown and crispy. An egg is cracked in the centre of the pan with the potatoes at the side. I use fresh thymes from my garden as I did not have any sage. Season with salt and pepper. Yum! A simple pasta with just cherry tomatoes, fresh basil leaves, garlic, capers, olive oil and seasoning. The recipes calls for 12 Cherry Tomatoes, I tripled it, we love Cherry Tomatoes! And I only cooked half a packet of spaghetti. Makes sure this pasta dish is season well with salt and pepper. A simple, yet delicious combination. My kids love it! So do I! I got these recipes from various websites. Heat the oil with the garlic to high in a frying pan, removing the garlic once it is aromatic and tip the potatoes in, spread them over the pan, including any little bits. Then leave them alone, don't turn them about at this stage, they will crisp up far better if just left to cook on one side. Turn the bits of potatoes so that another side is crisped up, and then once again, until the potatoes are golden and crisp nearly all over. Make two spaces for the eggs and crack them in the centre. Sprinkle over the sage, which should crisp up beautifully. The egg too may crisp a little at the edges, which is how I like it here, season with salt and pepper. When the eggs are cooked to your liking, slide the eggs and the potatoes (which will be sticking together now) onto plates lined with paper towel. Leave for a moment before pulling the paper carefully out from under the food. Put all the ingredients except the spaghetti in a bowl and season with salt and pepper. Leave for at least an hour if possible to let the flavours mingle. Cook the spaghetti in a large pan of boiling salted water, following the packet instructions. Drain and add to the tomato sauce, tossing well to coat the paste. Serve immediately with or without grated Parmesan. I have a can of Whole-Cranberry Sauce sitting in my pantry for months, and it is about to expire in three months' time. Got to use it quick! Found the perfect recipe in my new cookbook, "Cake Simple". In this recipe, Christie Matheson recommended to use homemade cranberry sauce, but we do not have fresh cranberries here, and even if I do find it, is gonna cost a bundle! Don't you just love bundt cakes? I do! Christie has even included the recipe for homemade Creme Fraiche if you can't find any. Which is great, as trying to find Creme Fraiche over here can be pretty frustating. So her substitute recipe definitely comes in handy! The cranberry sauce is added in the middle of the batter and at the top before baking. And as usual, I reduced a little sugar from the original recipe, which works out just right for me. The lovely cranberry sauce in the centre and at the top, (now the bottom!) I did not add on the almonds nor glaze the cake, but from the picture in the book, the glaze is a lovely shade of dark pink. This is a lovely cake, delightfully delicious! The cranberry sauce is wonderful with the buttery cake. The cake is moist, soft with tender crumbs, thanks to the Creme Fraiche. This is definitely a keeper recipe! Preheat the oven to 350F (180C/Gas 4). Brush the inside of a 10-cup (2.4L) Bundt pan with the melted butter and dust it lightly with flour. (Use a pastry brush to help distribute the flour and tap out the excess). Whisk the flour, baking soda, baking powder, and salt in a medium bowl until thoroughly combined. In the bowl of a stand mixer fitted with a paddle attachment, beat the butter with the sugar on medium speed for 2 to 3 minutes, until light and fluffy. Add the eggs, one at a time, beating well after each additon. Beat in the vanilla. With the mixer on low, add the flour mixture (in three increments), alternately with the creme fraiche (in two increments), beginning and ending with the flour and beating after each addition until just combined. Pour half of the batter into the prepared pan. Swirl half of the cranberry sauce over the batter. Pour the remaining batter over the cranberry sauce, and then swirl the remaining cranberry sauce over the batter. Sprinkle the almonds over the top. Bake for 50 to 55 minutes, until golden brown on top. Let the cake cool in the pan on a wire rack for about 15 minutes, then invert the cake onto the rack and let it cool completely. 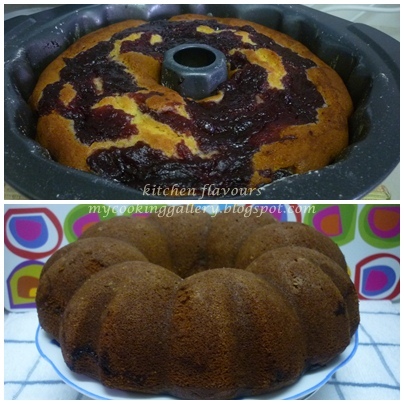 Transfer the cake to a serving plate and drizzle the glaze over the cooled cake. The cake will keep in an airtight container at room temperature for up to 2 days. Combine the heavy cream with buttermilk, cover tightly, and let sit at room temperature (in a warm room) for at least 8 hours. Stir the mixture - it should be thick and creamy. If it hasn't thickened completely, cover the mixture again and let it sit in a warm place for another 2 to 3 hours and check it again. When it has a nice, thick consistency, it will keep in an airtight container in the refrigerator for up to 2 weeks. In a medium saucepan over medium-high heat, combine the cranberries with the water, brown sugar, granulated sugar, and salt and cook for about 15 minutes (after about 10 minutes, remove about 1 tablespoon of the liquid for the cranberry glaze), or until the sauce has thickened and most of the liquid has reduced. Let the sauce cool completely before using it in the cake. The sauce keeps in an airtight container in the refrigerator for up to 3 days. Mix the confectioners' sugar, almond extract, and cranberry juice in a small bowl until smooth. All photographs and written posts contents featured at kitchen flavours solely belong to mycookinggallery.blogspot.com, unless otherwise stated. Any party interested to use any photographs or contents, either full or partial, or intended for a repost, please request for prior permission. If request is approved, please give full credit and post a link direct to this site. Please do not change, alter or amend any contents without prior consent. Kitchen Flavours is in Top 50 Malaysia Food Blogs List!